My BF had been craving root beer floats, so we picked up diet A&W and a carton of store brand non-fat, no-sugar-added vanilla ice cream. While he whipped up a frothy confection for himself, I considered how I could jazz up the fruit cup I’d gotten to round out the J-in-the-B Chicken Fajita Pita and side salad with balsamic vinaigrette I’d eaten for dinner. A light bulb went off, and I decided to take advantage of some of the unique food available in my girlfriend’s pantry where we were house-sitting. I combined the fruit cup – which included melon, pineapple, and grapes – with a cup of the ice cream and two slices of diced crystallized ginger from Trader Joe’s, and pulsed them ‘til smooth in the blender. 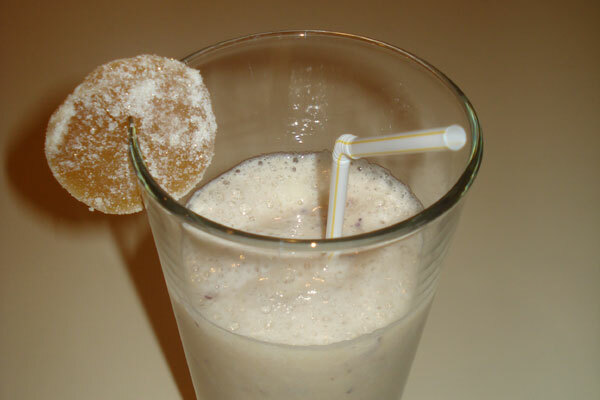 I poured the creamy blend into a tall glass and garnished it with a third slice of crystallized ginger. It was a little high in calories, but it was a delicious (and healthy) splurge! Finely dice 2 slices of ginger. Combine diced ginger, fruit cup and ice cream in blender. Pour into a tall glass and garnish with 3rd slice of ginger. Entry filed under: clean eating, food review. Tags: healthier smoothie.